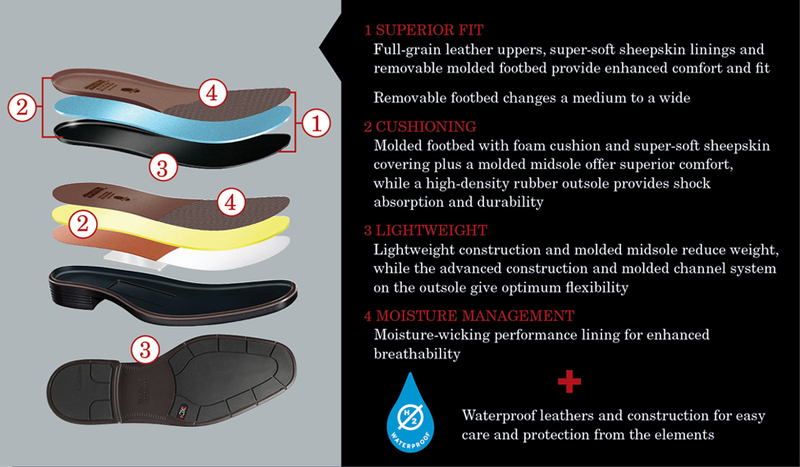 This style is waterproof and available in two widths: M/W (Medium/Wide) and EW (Extra Wide). Comfortable, Stylish & Rockin - Love It!!!! Everything which I wanted, expected and got. This is a great shoe, it is very comfortable. I usually wear inserts in my shoes, with these I don't need anything other than what is already in the shoe! These shoes run a little smaller than other Johnston & Murphy shoes I have owned both in feel and look. They do feel comfortable after breaking them in a little bit. I wear these out casually and professionally. I bought them primarily as an upscale waterproof work shoe to wear out in inclement weather to wear with suits. While they serve their purpose I would say that I prefer these for casual wear over professional based on looks. Durability is a question for these shoes. The sole has held up surprisingly well; however, the side of one foot where the toe cap is sewn in recently tore open. I do a decent amount of walking in all kinds of weather, but I do not expect the side of a shoe to split open like this. Most importantly, I do not know if I would call these shoes "waterproof." They definitely keep my feet dryer than non-waterproof shoes, but they have never been totally watertight. When I think of waterproof shoes I expect to be able to step in small puddles and get rained on without water coming in the sides of the shoes. These have never kept my feet totally dry and water definitely seeps in through the sides. Again, definitely a step up from non-waterproof, but if you are looking for a dress shoe that keeps your feet totally dry, my experience is that these will not accomplish that. Will they ever break in? I'm not sure how much more time I will spend wearing these shoes. I have owned them for 16 months and have worn them to work for 7 to 8 months in total. If people are looking for the Suffolk Cap Toe (same look, same price point, same comfort system, but discontinued) and want the equivalent, I recommend you keep looking. I am still alternating every other day (for over a year) between the Branning (hoping it will eventually break in) and a pair of Suffolks (nearly to the point of disintegration) because the Branning are refusing to break in to the point of being anywhere near where the Suffolks were after a few weeks. I know that some reviews say they have a very short break in period. I don't know if they had issues manufacturing some or if something has changed since I bought them last year, but that could not be further from what I'm experiencing. Smell can also be a factor. I know what you are thinking. This guy has smelly feet and he is blaming it on the shoes. I do not have this problem with any other pair of shoes I own. If I ever wear them for more than an hour, I can smell them when I take them off and it is not good. In conclusion, I recommend you look elsewhere for a comfortable shoe, I know I am. Im thinking about adding a 3rd pair! I started my collection of the XC4 line with a Brown, 'Branning' Cap toe, and recently purchased a pair in black.... No break in period needed...basically feels like I am wearing a casual, but well suppported weekend type shoe. I am seriously thinking about adding a third pair...just not sure of the colour just yet! Who would buy shoes at an airport?! I never thought that I would be one of those guys who would shop for shoes at an airport. Who knew? Well, I'm glad I did! I picked up a great pair (XC4) while I was walking through Toronto Pearson last month. Love the comfort... right out of the box... little or no breakin required. I will definitely be purchasing another pair...perhaps in a different airport next time! Seems to be a great durable shoe so far. I need a durable, comfortable, stylish shoe for work. On my feet for hours at a time. I think I found a shoe that I can replace continuously with the same style of shoe. Glad that it is waterproof. Take a long time to break in. This is a very good shoe. Very well main.